Just a quick scan of the internet will uncover some kid guitar prodigy guitar videos and it is wonderful to see! It is so exciting and encouraging to see such great young guitar playing talent. You will no doubt see the post titles – best kid guitarist in the world! Amazing kid plays guitar! The 10 year old guitar whizz kid! Underneath all of the hype and You Tube views, we are seeing young children excelling at guitar and showcasing their talent for us all to marvel at via the internet. I can see these young children having fun and oozing with pride at their achievements. It is for us all to see, hear and admire what can be done even at a young age. Most children when they start to learn guitar will get frustrated and annoyed at their lack of progress. That is the harsh reality of learning anything new and in particular when you start out learning to play guitar. Guitar is too hard to learn! I will hear statement being uttered by a frustrated child from time to time! The child is correct though. Learning to play guitar is hard but with a plan in place progress will be made! It’s not just children! All of us can go on the defensive and surround ourselves with excuses about why we cannot make progress. So if you are thinking abut guitar lessons for kids and what age to start just take a look at some of these unbelievable videos below to see how age is no obstacle to these young guitar stars! I have picked 10 (but there are lots and lots out there) as an inspiration for all the young guitar players out there of what can be done. It does not mean that you will play like this or even want to play the particular styles of music played by these young guitarists! It does show you what can be done! Ray Goren is 11 years old in this video playing some mean blues guitar! He has since gone on to forge a career as a professional guitarist. Check out the amazing blues rock guitar playing from this young man on a classic BB King. The thrill is most definitely not gone and the future of guitar is safe when you have great guitar playing like this! Next up is 7 year old Zoe Thompson ripping through the intro to Sweet Child O’Mine by Guns N’ roses. Slash himself tweeted that he was speechless when he saw footage of this super 7 year old’s video of the rock classic. Just shows you that anyone , even your guitar hero, might see you when you post a video online!!! in this video, Tallan is 8 years old! Check it out! There’s really nothing more to say!!! This baby rocks!!! Check out the amazing 8 year old Japanese girl playing some serious shred on guitar – this young lady is bound to have a rocking future! Konstantina Andritsou is a 7 year old girl from Athens playing a beautiful piece of classical guitar. A 10 year old Harry Jackson playing a superb guitar solo! There is no doubt that the children in the above videos have exceptional talent and have obviously put a lot of hard work, time and effort into developing their guitar playing. Garth Brooks gives his guitar away to brave fan! 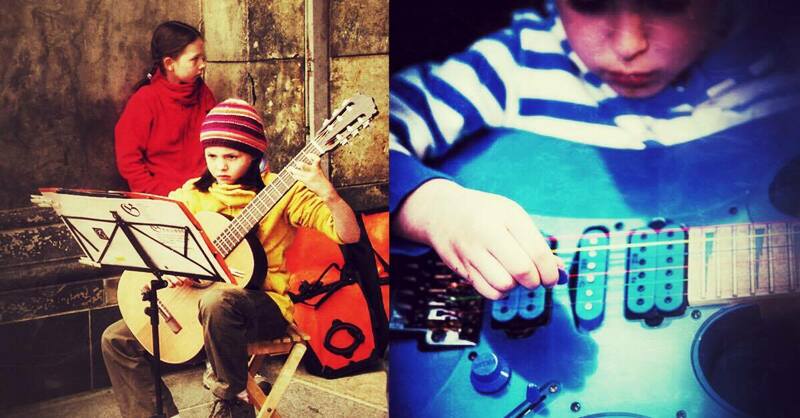 15 Reasons why Kids should play guitar! Check out the video lesson below on how to play the intro to David Bowie's Ziggy Stardust!